When it comes to metal security doors, it's all about the strength of the materials, the decorative scrollwork, grids, gratings, and welded iron mesh. The durability of a metal door relies upon the quality of workmanship, the quality of the hinges and bearings that support the door, and coatings. 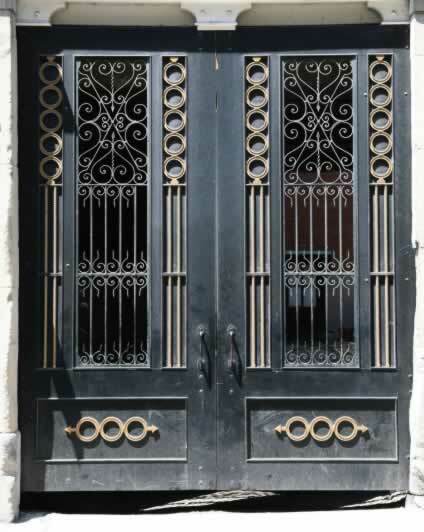 In this example, the antique metal double-door set shows the markings of a long life, particularly in the reinforced kick panels. The ornamental work in this metal door retains much of its original grandeur. But if you were choosing a replacement or new reproduction door for your home, it might pay to ask for installers to include reproduction hardware that will secure your investment over the long-haul. Additional masonry work can further add appeal in creating a more solid frame and footer.